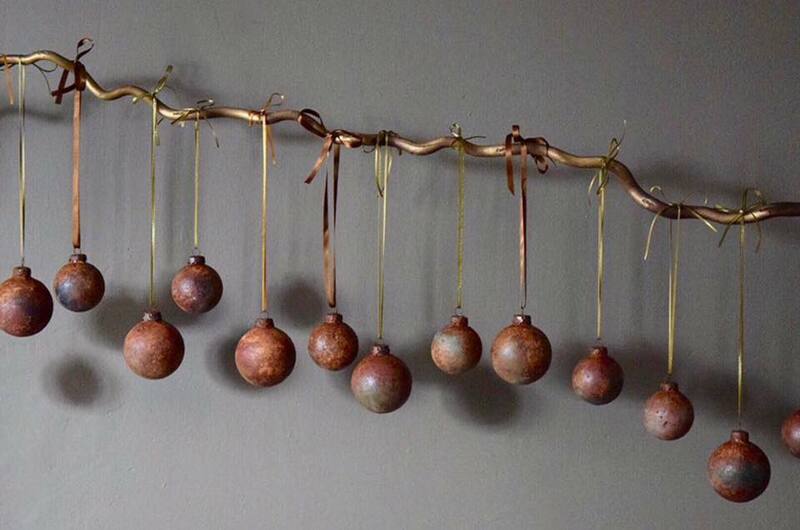 Never quite sure how to talk about my rusty baubles but here goes….! 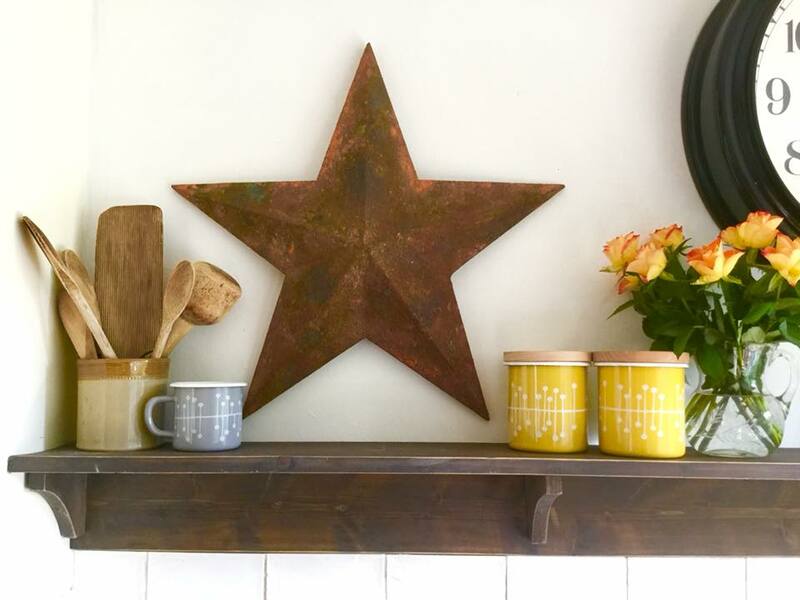 As you probably know I am obsessed by patina, textures, faded and aged beauty and rust sits up there as pretty much one of my favourite faux finishes to create. 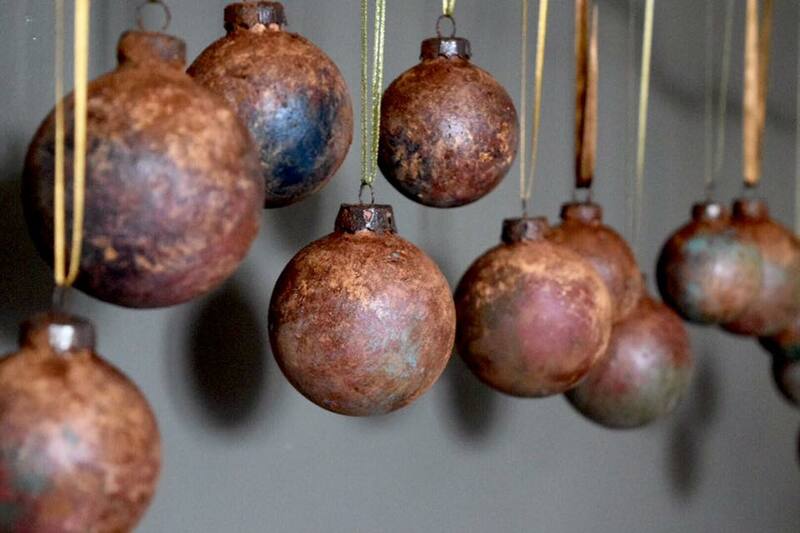 Here’s a quick how to step by step guide to giving your Christmas a little rusty magic! Take a handful of old, scratched plastic baubles and give them a light sand to ensure the paint sticks. Choose your favourite colours for a base coat. 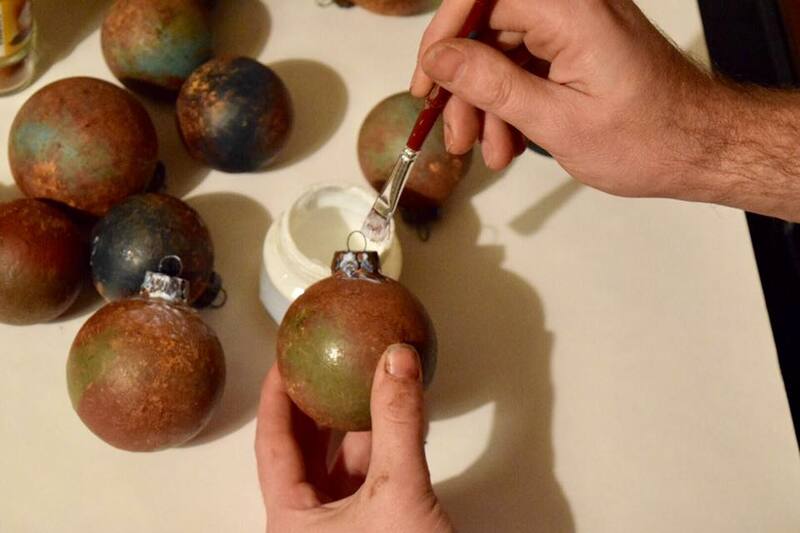 If you want to avoid getting paint everywhere, pop off the looped hangers which are often just slotted into the bauble using wire and hold the bauble in place on a pen or stick as I have done – although it didn’t stop me getting messy! 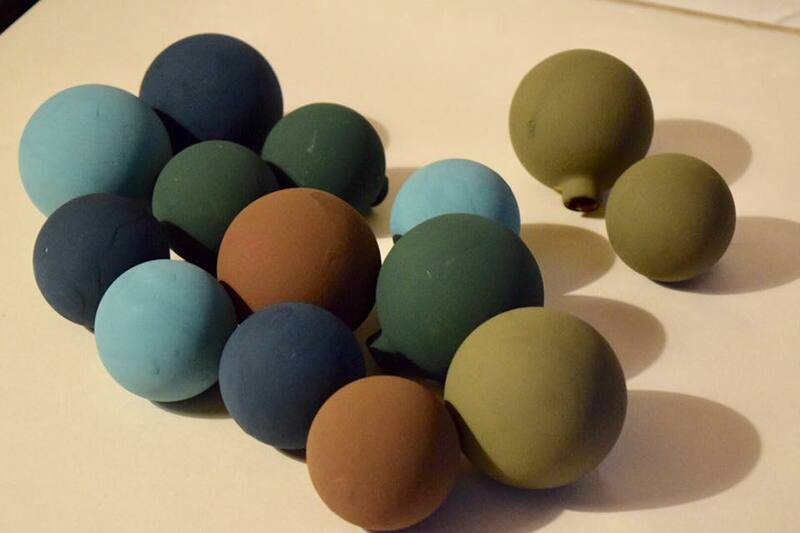 I picked colours which suit my home decor – Provence, Aubusson Blue, Amsterdam Green and Olive all by Annie Sloan. After a light base coat, it’s at this point you may want to introduce texture with Saltwash. 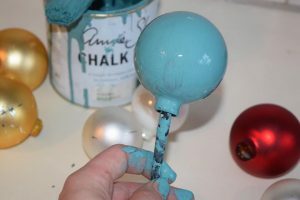 You can do this just with paint, especially old paint that has been in an open can for a while. For quick, results Saltwash gives you that texture just by adding it to the paint to create a thick textured consistency which helps look like rust. 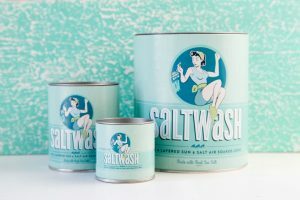 To find your nearest stockist go along to Saltwash and click your country’s links. For rust colours I use Arles, Barcelona Orange, Primer Red, a bit of Graphite and Barcelona Orange. Any of these can be mixed with Saltwash to create the rusty textures you want for authenticity or you can mix Saltwash with Honfleur and apply flecks of the other colours over that base texture. I don’t completely cover with ‘rust’ I allow bits of the base colour to show through like natural aging. I then reattached the hanging loops and apply a light coat of Image Transfer Medium ready for my secret ingredient! 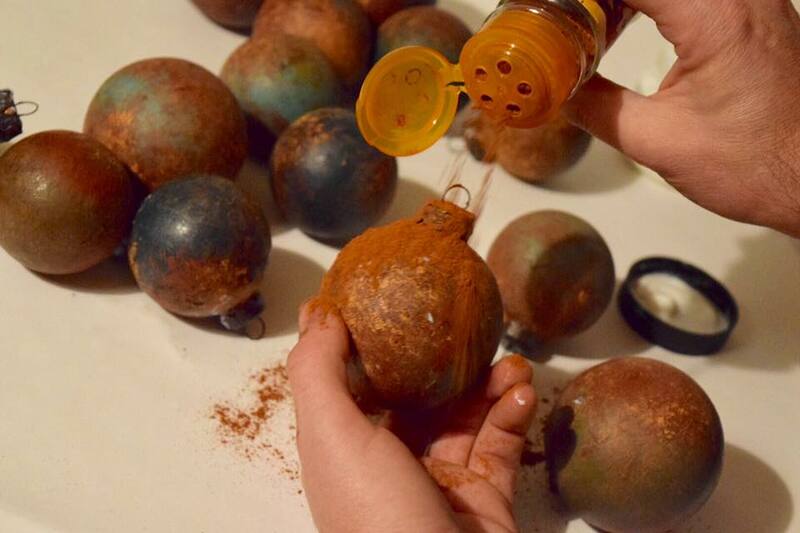 A generous sprinkling of cinnamon will stick to the areas you applied the glue, especially if you dab with a brush. 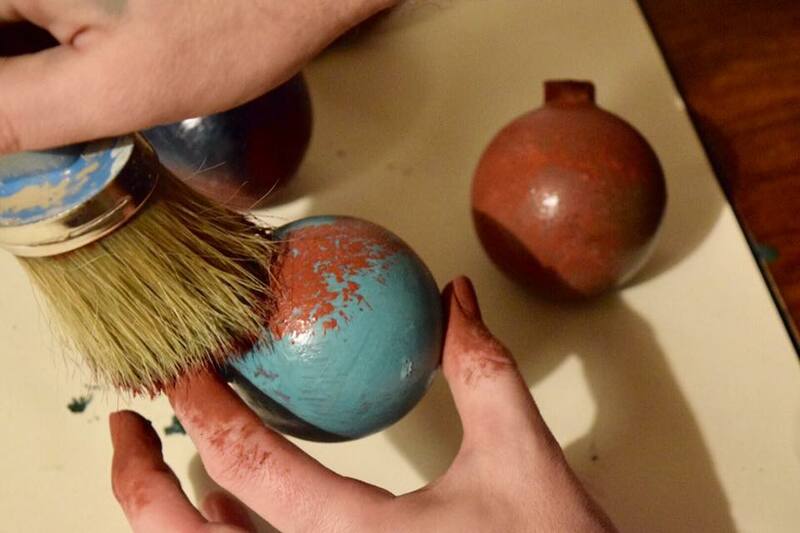 As well as looking amazing, this process fills your house with the scent of Christmas! A close up shows how authentic the mix of texture in the paint and cinnamon sprinkles really is! Sticking a little cinnamon to the loops really ensures an authenticity to the aging process, these look like ancient found baubles ready for you to attached last year’s present ribbon to recycle and reuse. 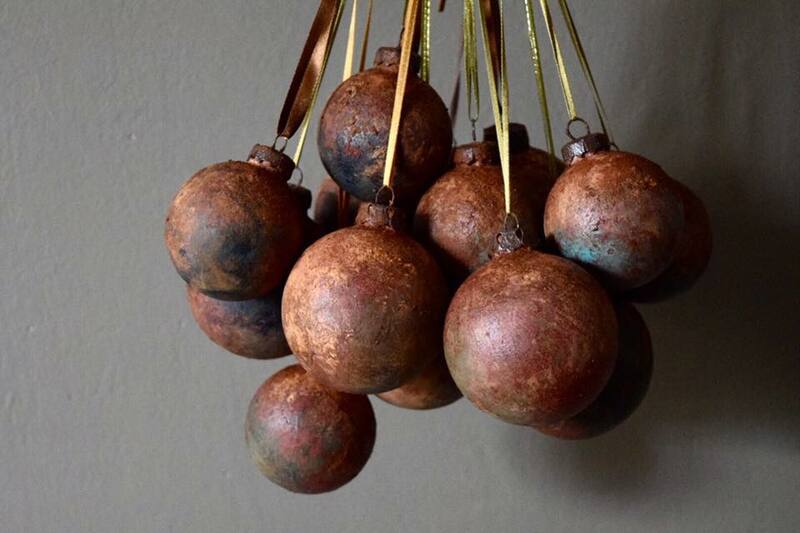 A cluster of these rusty gems suspended to one side of the fireplace or dangling from a wall light or banister gives Christmas a handmade contemporary twist that all my guests really appreciate. 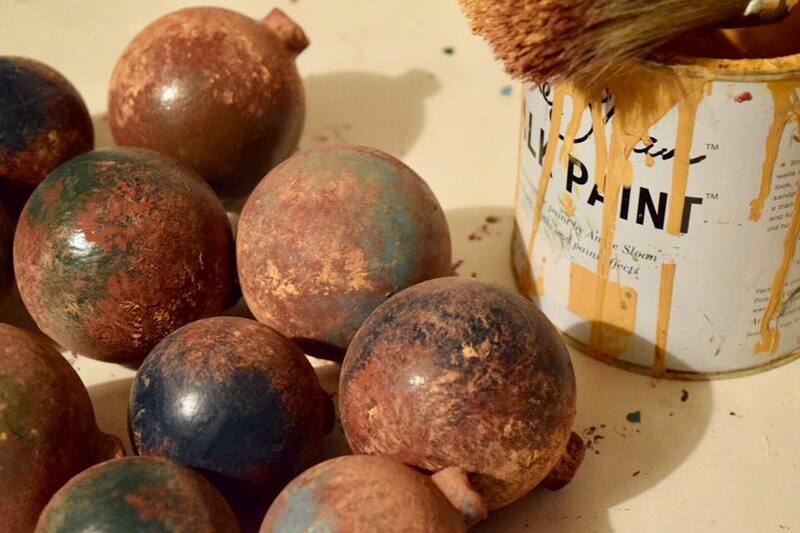 This makes a lovely class to teach if you’re a paint stockist – or a little project to complete at home with family and friends – all you need to add is a glass or two of mulled wine and mince pies! 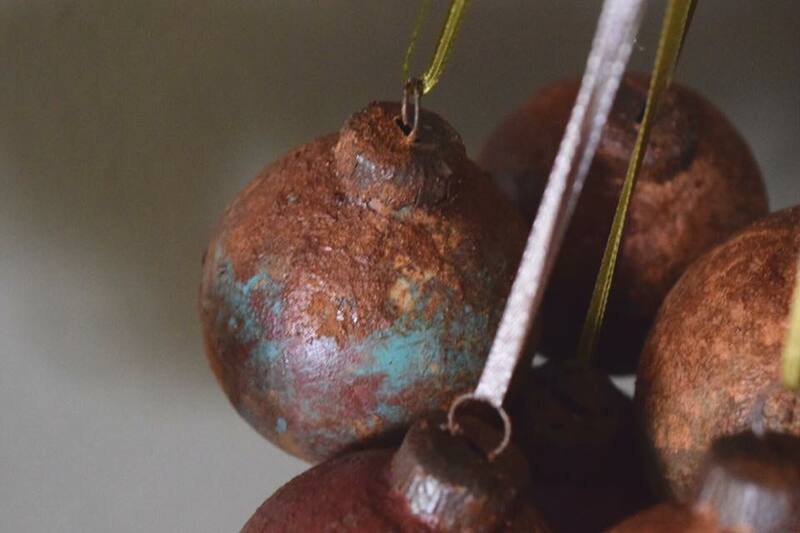 If you’d like to delve into these techniques in more depth, I would recommend my Saltwash Verdigris tutorial to perfect the art of adding texture to urns, pots, lampbases, statues etc and for intricate detail on how to build and layer rust colours in all the right order try Modern Industrial Rust. 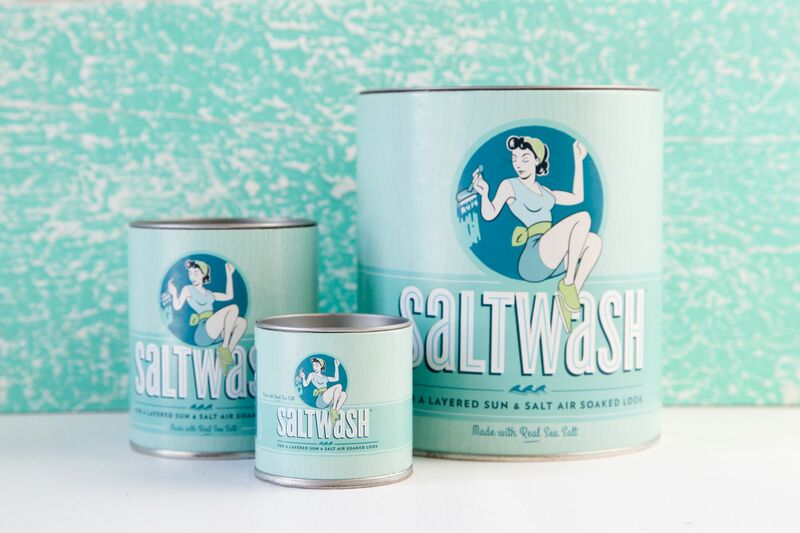 For £5 off Saltwash Verdigris tutorial just use SALTWASH as discount code at checkout. 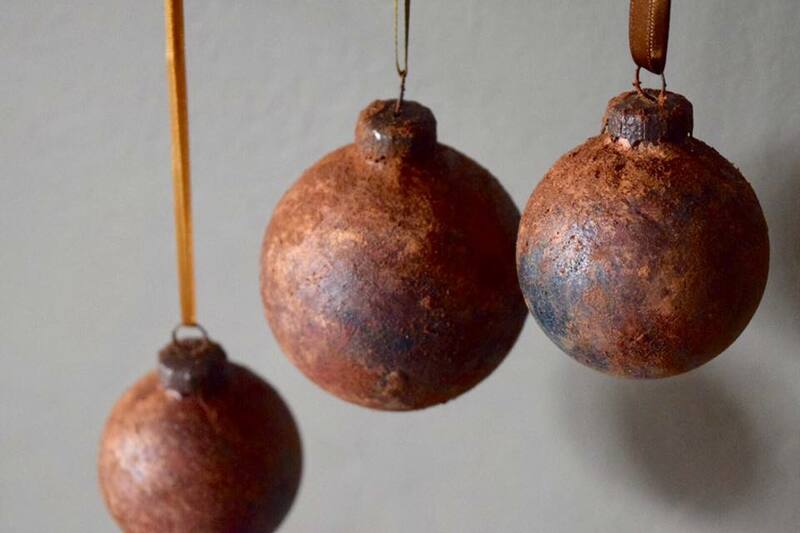 For £10 off Modern Industrial Rust tutorial just use STAR as a discount code at checkout. They are absoutely fab . 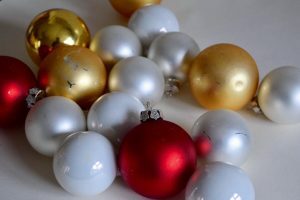 Thank you Marc for those ideas with the baubles. Great way of recycling. Merry Xmas and a happy New year.